This may be my favorite outfit I've worn in a while. The vintage fit & style of this paired with the modern & bright bubble necklace just made me happy all day. I took advantage of a cool morning and rocked my boots that I recently got back from the repair peeps. For some reason, people don't like to wear boots in the summer...I'm all for it. I live in Colorado, after all. I think it works. It also just seemed like the only pair of shoes that "anchored" down my outfit. I need some navy flats, I suppose. *I got these boots for $15 in January of 2010. I've worn the HECK out of them and got them re-soled and oiled at Perry's here in Boulder. That cost me $25. I've spent a whopping $40 on these suckers and will probably get another 2 years out of them, at least. Winning. 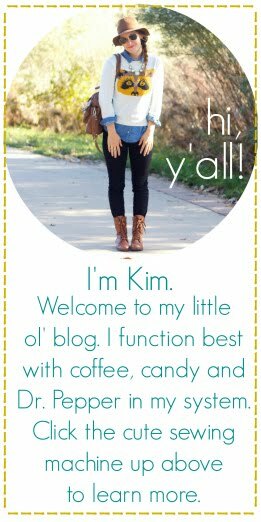 ***Linking up with Lindsay! and casual friday! I have those same boots from target. I wear the heck out of them all fall and winter. Love them with this summery dress! this definitely should be your favorite outfit - it is adorable and I love everything about it!! I love this outfit! And I might just have to try that hairstyle on myself. It's totally cute! Your outfit and hair are adorable, as always. Funny, I just saw these necklaces on VeryJane last week I believe but I'd purchased one about 3 weeks prior on Ebay. Mine is the coral color and I love it! i ordered one on ebay too :) can't get enough! that dress looks great on you! and boots are too awesome not to wear more often. thanks so much and i have to agree about the boots. LOVE them. I love the look of boots + a dress! I LOVE this look, and brown boots in the summer–they always look so chic! I loooove the dress! I saw it in the store over the weekend but I didn't try it on...I didn't want to tempt myself ;) I love the look with boots, it's definitely a dress you can wear year round! i have a similar necklace in turquoise!! i really want a white bubble necklace too!! I absolutely love Cowboy boots and have a really nice pair my husband bought me a couple years ago. Well, we moved to Colorado a month ago and I wore them with some skinny jeans downtown and I was the only one there in anything like that....it was strange. I thought I'd totally blend in but instead I stood out. 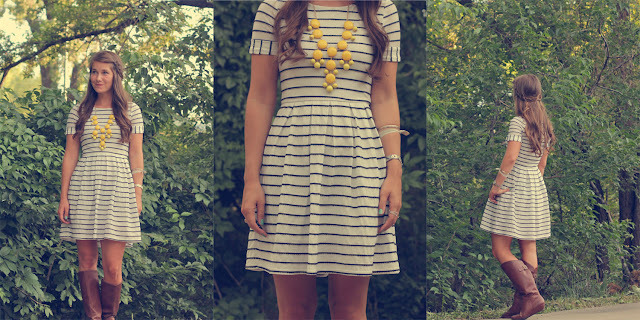 I LOVE the striped dress...that would also be cute with a nautical twist....little Tom's flats? CUTE! 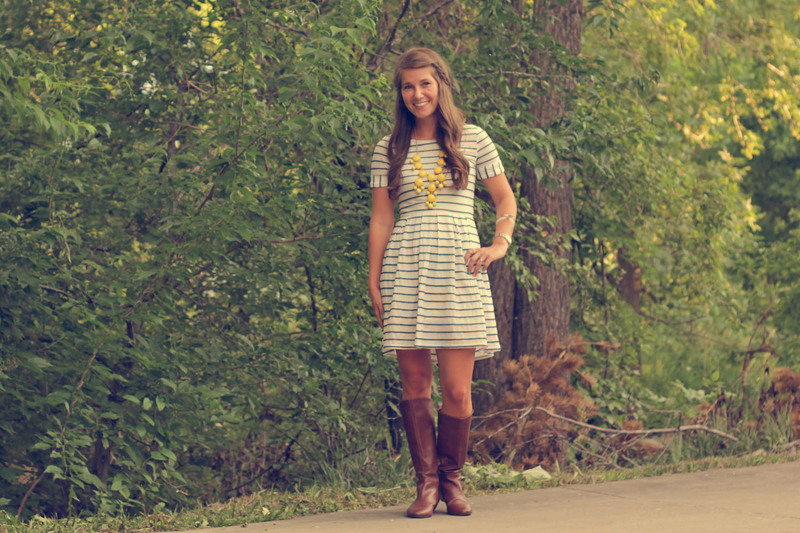 Love the black and white stripes with the bold yellow necklace! That dress is from target?! I hope you got it there recently cause me want. You look ADORABLE! 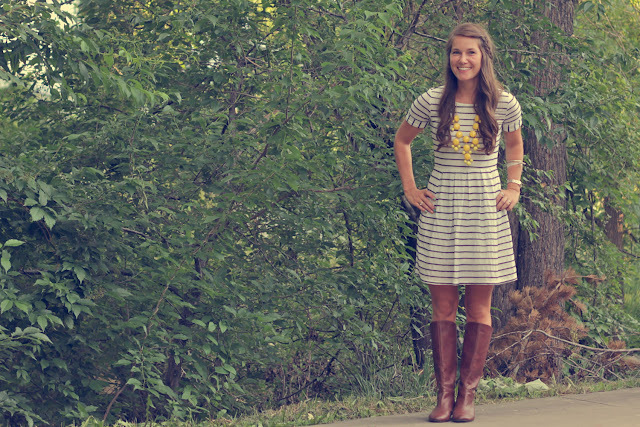 Love the boots with the dress, and the pop of color on your necklace is the perfect touch. This outfit is adorable as are you! I just got a black bubble necklace but you are really making me want the yellow...might have to take advantage of that discount! I totally have those boots, they are the best! I actually picked them up at Savers for a pretty good price and they are now my go to boots! Also, that dress is totally adorable! What a lovely outfit! Pretty hair too. ;) Found you trhough the pleated poppy! Great outfit! LOVE that striped dress. Oh my gosh I want to try and DIY this dress so bad. What do you think, can it be done?! Love the styling of this outfit, pairing it with the boots and that bold necklace was perfect. Glad to have stumbled on your blog today! I just found your blog searching for this dress, which I just bought in red and brown on sale. Hooray! You look so cute in the white/blue version. I love your blog. So glad I found it.